Remember this statement? and this post? Well, it's time. 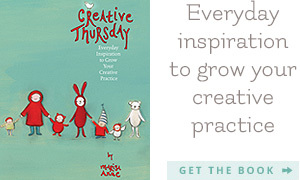 3 years ago this month of May, I started a little podcast called Creative Thursday. I can still remember the day I decided to do it. I was so excited, because I knew ~ I knew this was the chance for me to fulfill a mission that began almost the same instant Creative Thursday began, the chance to encourage others to follow their creative dreams. Some people are content privately doing the work they were meant to do and some people feel compelled to take that work to be a voice in the world. I've always felt compelled. And believe me when I say that if you get within earshot of me, there's a really good chance that I will start asking you about your dream and then I will do everything in my power during our time together, even if it's minutes, to convince you to follow it. I can't help it really. It's what I do. It's what I've always done. Just ask the doorman at the Improv Comedy Club here in Hollywood. I've often wondered if we might actually have a chance at achieving world peace, if simply more people on this planet were following their true path in life. So, I started a podcast with the hopes of making a difference, growing a following and eventually growing that into an income. 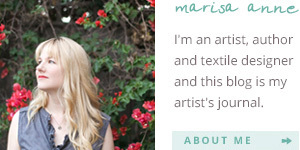 As it turns out, during the process of sharing my creative journey, my creative journey became a thriving business. The thriving art business took over the time alloted for the podcast, and in all my best efforts I was not able to make it back to that intent and mission of Creative Thursday. I've been skirting it long enough, dipping my toe into the world of sharing my voice when time allowed. But now it's time. Creative Thursday, the art business is ready to stand on it's own a bit more, while I revisit my other passion of supporting others to follow their dreams. Sometimes, I honestly feel that one of the reasons I was so passionate about starting and succeeding at a business I love, was just so I could confidently say to other's, yes it's true, YOU CAN DO IT. This was my very long introduction to announce my e-course. I know we are now heading full force into a time of e-courses. I am not the first and I won't be the last. And I think it's wonderful and amazing that technology is enabling so may of us to share what we have learned with each other, all over the world. The more we can learn from each other, the more likely it is that we will begin living the lives that we truly want. I've been waiting until I finally felt that I had the experience, to confidently share what I've learned with you. You may know Creative Thursday from the time I started my podcasts and my blog in 2006, but Creative Thursday began the moment I stepped out of college and worked my first creative job. The drive to become self-employed doing work that I love, compelled me on a journey that brought me here. And while there were days when I wished it would've happened sooner, I wouldn't trade a minute of it, because I now know that every bit of experience I have had on this path is going to serve the teaching that I am beginning to do both in person and online. A few details about class. What's the e-course going to be about? Marketing, Making a Living and Maneuvering Online, while staying true to who you are. I will be touching on every one of these subjects. For this first course I also will be personalizing it for the group attending. Why did you call it "In the Fish Bowl"? I was sitting outside with Sean one evening when I said to him, "being an artist online is like being in a fish bowl" and the more I thought about, it the more the metaphor made perfect sense. Being online you have to be willing to be transparent, and much like a fish in a fish bowl, you must find a contentment within that transparent world. Finding your place and comfort within this rapidly changing online world, will enable you to take advantage of all the amazing possibilities that exist within it. And it goes without saying that developing smaller communities, we'll call them fish bowls, of authentic friendship and support within the whole is vital. Why should I teach this course? I'm not a big fan of long lists of accomplishments. I would rather let my podcasts, blog and business speak for itself, and let you decide. I will say that I grew a business that sold one greeting card during a holiday season into one that now sells thousands of pieces of art all over the world in 2 1/2 years. And I did it online. This is a limited enrollment e-course lasting for six weeks, and beginning Creative Thursday, June 18. You can find all the details here as well as register. Please don't hesitate to email me or leave any questions in the comments below. So, I'll see you in the Fish Bowl!! !